Hampton Art has some cute new mini stencils, the butterfly and mushrooms are one of those sets. 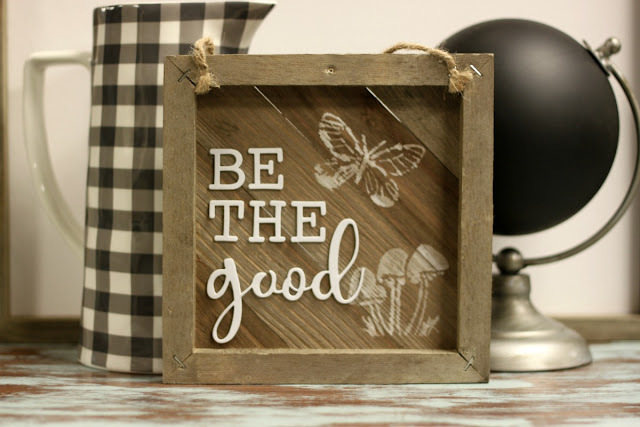 This wood plank is super easy to recreate, the stencils were added to the backside of the plank with a white chalkboard marker giving it a ghostly effect. Then the “Be The Good” sentiment is new foam stickers by Jillibean Soup, literally pull and stick onto the wood. There you have a cute sign made in the wink of an eye.